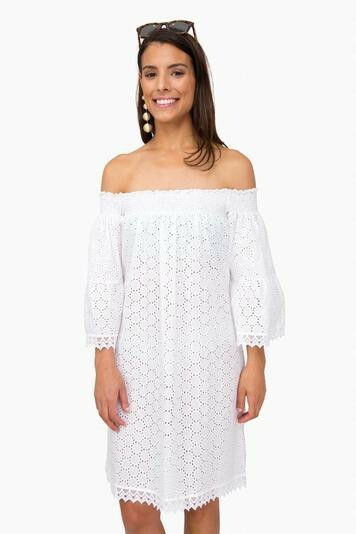 The Eyelet Ariel Dress features crochet sleeves, adding a feminine touch to this delicate daytime dress. 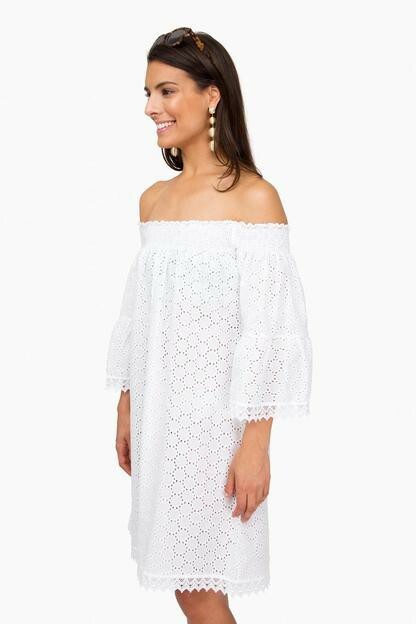 Pair with sandals for an afternoon stroll or wear as a beautiful cover-up to the beach! Makes me look a little wider than I’d like since it isn’t fitted but that’s to be expected. You can see right through it so plan accordingly. I loved the look of this dress - and when it came in the mail, the pattern and color looked just as it did on the website. The fabric was a lot thinner than I expected, but that's ok for something meant to be worn in the summer. The sizing however is a bit off. I ordered a small (I normally wear a size 2-4), but that was huge. I had to get an XS instead. Overall, great dress. Great transitional piece! Love the sleeves! I've worn this dress so much since I ordered it, definite summer staple. Easy daytime throw on or use as a cover-up. I'm 5'2 and it hits right above my knee. Love the lightness of the fabric too, very breathable for summer.